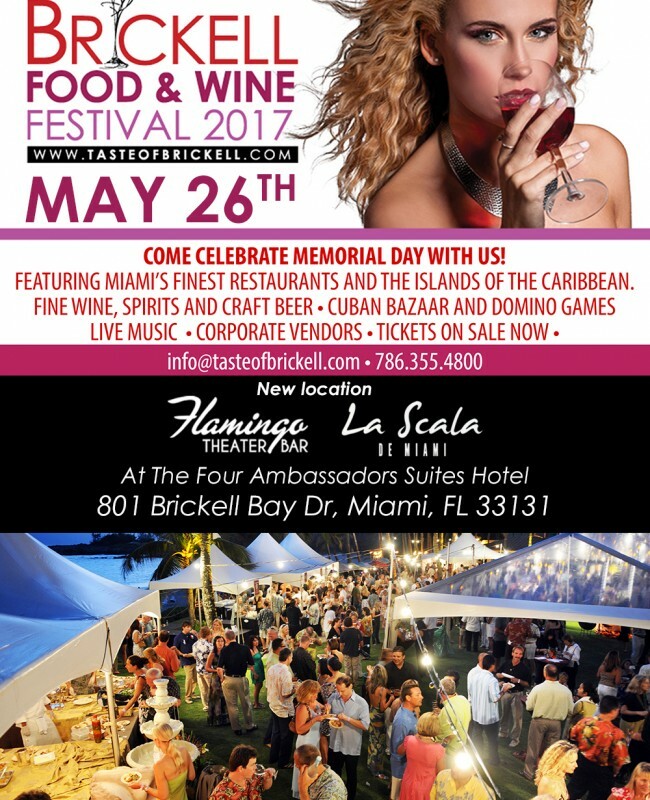 The 8th Miami Taste of Brickell Food & Wine Festival Is Coming Soon! Come Celebrate Miami’s Biggest Culinary Event of the Year! We are glad to announce Coconut Grove Food & Wine Festival to be held on Saturday, November 24th, 2018 between 1:00 pm and 9:00 pm at Peacock Park, Coconut Grove Miami, FL 33133. 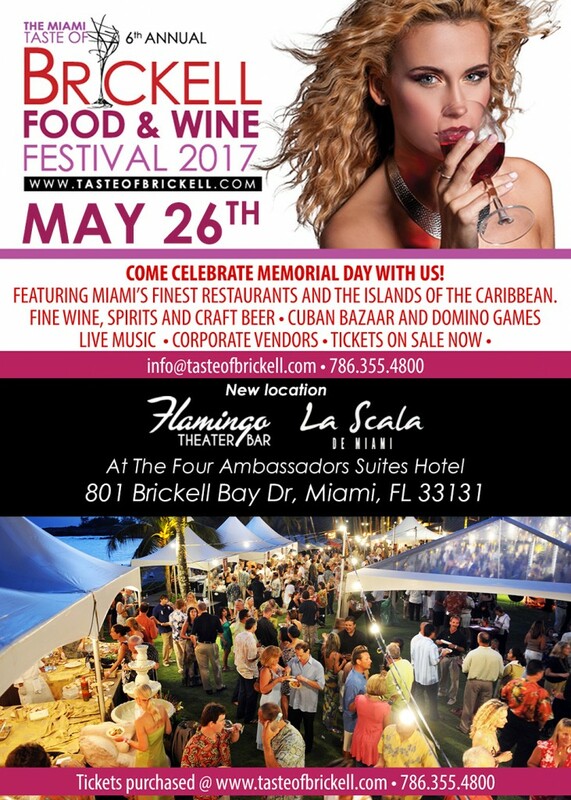 For more information on The Coconut Grove Food & Wine Festival contact 786-355-4800 email c_bettner@yahoo.com – www.coconutgrovefoodandwine.com. Beverage tickets can be purchased on site. Beverage Tickets have no cash value and there are no reimbursements. Beverage Stations alcohol and non-alcohol do not accept cash. Only Taste of Brickell drink tickets that are purchased at designated ticket stations. Restaurant samplings range from $1 to $12 with each restaurant serving a special signature dishes. All restaurants are accepting cash and credit cards only. VIP coupons are accepted for a free sampling at designated restaurant booths inside festival. Alcohol and non-alcohol bars accept tickets only, no cash is accepted at these locations, you may purchase beverage tickets at entrance and at ticket stations located on festival site. General admission allows entrance into festival and offers live continuous music, chef presentations, automotive showcase and giveaways. Explore the many Vendors and Sampling Sponsors on site. The Brickell Deal is a ticket that can be purchased for those who live work and play in Brickell. It includes FREE ENTRANCE and also 4 complimentary drink tickets for any beverage with a value of $8.00 GOOD FOR NON-ALCOHOL AND ALCOHOL BEVERAGES. There is no change given back on these tickets and have no cash value. YOU MAY PURCHASE ON THE TASET OF BRICKLL SITE. ACCESS INTO VIP EXPERIENCE LOCATIONS FOR COMPLIMENTARY SAMPLINGS OF WINE AND SPIRITS. You must wear the bracelet issued to you to enter into the VIP areas. Your VIP experience includes all-access throughout The 6th Miami Taste of Brickell Food & Wine Festival. Enjoy walking around the featured restaurant booths and other exhibitors on site while enjoying live music just perfect for the atmosphere. Small pets and service dogs are allowed in festival, Brickell park is open for all pets. Beverage tickets have no cash value and there are no reimbursements for unused beverage tickets. Beverage stations do not accept cash. Children are welcome – 12 and under are free for entrance but must purchase food and beverage on site excluding VIP areas. Coolers, Outside Food or Beverages , Firearms are NOT ALLOWED inside the Festival. We Reserve the right to search any in coming bags. VIP Experience Locations: Enjoy VIP access and sample complimentary fine spirits, exclusive wines and International cuisine. VIP’s will be issued 5 FOOD tickets to eat at on-site restaurants. Also, partake in wine tasting sessions and culinary presentations which will be noted in your VIP program. After Party Experience: Enjoy free entry into the exclusive night clubs which are part of our after party lineup. Dress code may be required. All access in/out throughout the festival. VIP Locations which include: Unlimited wine and fine spirits tastings, gourmet product samplings. Festival Food and Wine, Live Music. 21 Years & Old Only. This is a walk into event, there are no street closures. The easiest way to get to the event is to take Metro rail and get off at Brickell station. Walk towards Brickell Avenue. The closest Metro Mover location to festival is 8th street station or 5th street station. There is a Free Trolley Service that drops off right in front of the festival. There are several local garages offering flat discounted rate parking at 777 Brickell Avenue Garages. Again this is walk into event.